Strong thunderstorms kicked off a busy few days of severe weather on Saturday, spawning destructive tornadoes and dropping large hail across parts of the Plains and Southeast. At least 13 people were injured and numerous buildings and vehicles were damaged from the storms, which were grouped in two complexes on Saturday. One area of storms spread damage along a 600-mile path from the Ohio Valley to the Carolinas, while another complex spawned tornadoes in Iowa. 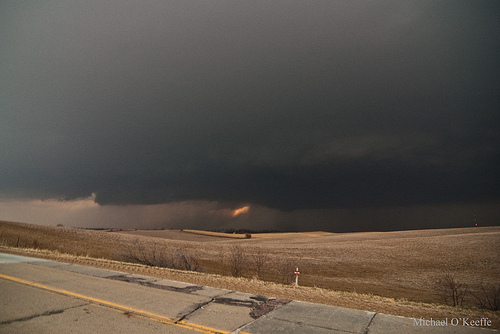 Several large, "wedge-shaped" tornadoes left a trail of destruction across western Iowa on Saturday evening, extending from southeast of Sioux City to north of Fort Dodge. One of the hardest hit communities was Mapleton, located in Monona county, which Iowa Gov. Terry Branstad declared a disaster area. Emergency crews and the National Guard were still responding on Sunday morning to the reports of destroyed homes and farm buildings in Mapleton, and other towns to the northeast including Early and Pocahontas. The Red Cross has also established shelters for displaced victims. 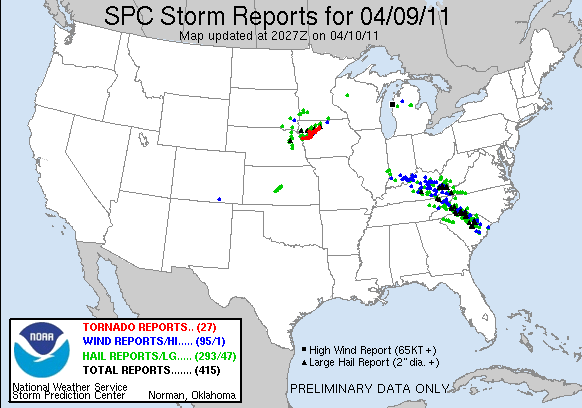 Tornado chasers on the ground helped relay reports of the tornadoes to the National Weather Service (NWS), surely saving countless lives. Officials from the NWS will conduct damage surveys today to determine the strength of the twisters. Unfortunately, more powerful thunderstorms and tornadoes are expected to form later today across the Midwest and Mississippi Valley. A separate area of storms spared the Southeast of any tornadoes, but brought plenty of large hail and damaging winds throughout the day as it traveled from Kentucky to the South Carolina coast.Hail, up to the size of softballs (more than 4.25 inches in diameter), dented cars and homes while shattering windshields. At an airport in Gastonia, N.C., multiple planes left on the tarmac were damaged by large hailstones. In most cases, the hail from the thunderstorms was contained in columns of damaging winds and heavy rain, or "wet microbursts," that dropped visibility to near zero as the storms moved through. Thunderstorms passed directly through Charlotte, N.C., during the evening hours, bringing down numerous tree limbs as winds gusted to near 50 mph. Earlier in the day, 95-mph winds were reported from a microburst in Marengo, Ind. Quieter weather is in store for the Southeast today as temperatures warm into the 80s. Unfortunately, more gusty thunderstorms will be possible late on Monday and early on Tuesday as a cold front approaches. 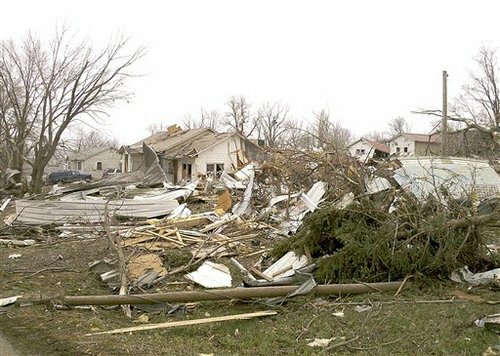 The twisters caused major damage to about 60% of Mapleton, a city of about 1,200 residents. As of 2:30 p.m., all non-residents were still being barred from the community, which is about 45 miles southeast of Sioux City, due to concerns about a gas leak. The high winds tossed cars and tractors, tore off roofs, caused a car wash to collapse, uprooted trees and downed power lines. Yet Pratt said there had been only minor injuries, giving credit to advance warning as well as an emergency response effort that included authorities both local and from elsewhere. Amateur video recorded by storm chasers shows a large funnel cloud spinning across a flat terrain outside Mapleton. In the background, a passenger can be heard exclaiming, "It's going to hit that town! ... Mapleton's in big trouble!" Afterward, National Guard troops were brought into the area, according to Stefanie Bond, a public information officer for the state's Homeland Security & Emergency Management Division. She also said that natural gas service was temporarily shut off in the city. The Red Cross was also on the ground providing assistance. The National Weather Service in Des Moines reported tornado sightings by storm chasers and trained spotters in as many as 11 towns and cities northern and west central Iowa over a four-hour period Saturday night.